I’m in the CBS Newsroom serving as a liaison to the Evening News Fishbowl and providing those in the Fishbowl with any operational and logistical support they need. In the Fishbowl are the five Senior Producers, the Executive Producer and our Managing Editor and Anchor Scott Pelley. I spend much of my time helping producers prepare elements for pieces, researching and finding material for stories, feeding raw material out to our other Bureaus where a piece is being cut, and I’m in the Control Room during our broadcast running scripts to the Director and AD. How did you degree and/or classes at Mason help you land the job? I can’t pinpoint anything specifically, but I think it was a combination of my classes and great professors. The work I did proving myself as a CBS Page is really what lead me to obtaining a staff position here at CBS News (which are few and very hard to come by at any network). Having a degree specifically in Communication didn’t really make a difference. My experience in University Life through the student organizations which I was part of, such as WGMU Radio, really helped me lay an amazing foundation of knowledge that got me here. 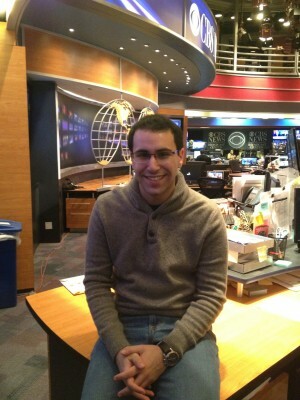 I love television, I love journalism and I love news…this job combines all of them which is amazing. Researching and preparing material for pieces that are going to be on-air is certainly my favorite part. There’s not anything specific that’s challenging. It really varies because sometimes I can find an element or piece of footage very easily, sometimes not. Sometimes I can get in touch with a source very easily and they’re willing to speak to us, sometimes not. When you’re doing what you love though it doesn’t feel like work and I’m really grateful and humbled to be in that position. What advice would you offer to anyone trying to go into a similar field? Getting into the media/TV/journalism field is tough and there aren’t many jobs. It’s all about proving that you’re a competent, hard worker and knowing the right people. Who you know is really 90% of getting your foot in the door…then you need prove yourself. You have to network. Don’t stop pursing the dream of television or journalism because you’re discouraged you can’t find something. Keep on pushing and never give up. So many times I felt discouraged that I wouldn’t get hired on staff, but I kept up on the pursuit, stuck to the plan and it worked.